East Medina Mill was a tidal mill situated where the modern day Island Harbour is located at the end of Mill Lane off North Fairlee Road at Binfield, between Newport and East Cowes. It was built about 1790 by a Mr Porter of Newport and became known as the Botany Bay Mill because it supplied the transports waiting in the Solent to transport convicts to Australia. On a spring tide the mill could operate for 6 hours per tide. The site was used as a hospital and barracks for the troops of King George III, they being Hessian mercenaries from Germany and Prussia. In the early 1800's, during the Napoleonic wars, French prisoners of war were barracked at the Mill. There are records that in 1794 84 soldiers died of typhus and were buried in Whippingham Churchyard, the Parish Register does not indicate where they lived/died so the connection to East Medina Mill is uncertain. 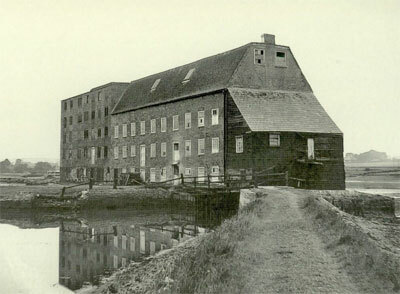 In 1933, Newport Corporation acquired the Mill and installed a tenant who retired before WWII, by which time the site was used by the Corporation largely for storage. A fire severely damaged the mill in 1946 and the building was demolished in 1950. The late 18th century East Medina House is all that remains of the mill buildings.